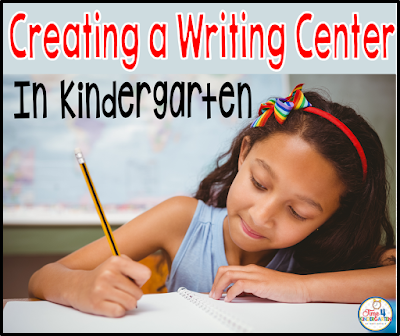 Setting up and creating a successful writing center in kindergarten takes time and practice. The writing center in kindergarten in something that is always changing. In the beginning it might start out with play-doh, rice or sand and as time moves on it will eventually move towards the end goal of traditional paper and pencil. I teach writing whole group and small group. I do a lot of whole group instruction in the beginning mostly through my morning message, then moving into the writing block. I try to make it fun and interactive, demonstrating the importance of neatness, reminding my students that there is to be no "scribble scrabble" when coloring. The very first piece of writing they do in a self portrait. We do this on the first day of school. This is a great way for me to assess their writing abilities. I can tell a lot by their self portrait. The majority of my students enter school with very limited experiences using crayons, pencils and scissor. Very few can write or recognize their name. This is where our writing center begins. 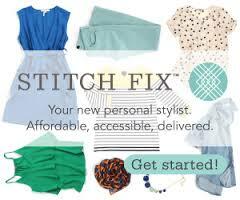 We start with the very basics; tracing and cutting lines and coloring inside shapes. All of these skills are carefully demonstrated and practiced. 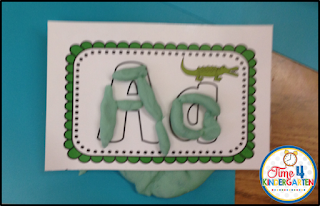 Next we begin with introducing letters and numbers through play-doh, stamps, rice, shaving cream and such. The kids love it and it is great for those kids who have sensory needs too. Of course I am also introducing name writing at this time. We do several activities that involve rainbow writing using the large crayons. By now we are probably into the middle of October early November and we have moved on to writing our first names and letters of the alphabet as well as the numbers 1-10 using proper letter formation. Items in our writing center have changed as well. We are now adding sight words weekly to our word wall. 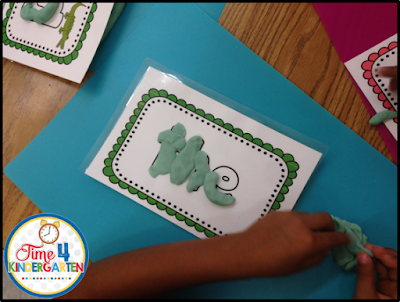 Although we still use play-doh, rice has been replaced with white boards, magnetic letters, letter beads and other word building materials. First we were forming letters, now we are making words, next we will be writing sentences. Remember, we must first build the foundation before we can create strong writers. In my writing center you will also see our Monthly Writing Center Word Wall. It has two purposes. It is great for working with my English Language Learners as it serves as a picture reference for building new vocabulary. Later when the students are writing more independently they can refer to the monthly word wall when they need help spelling a word. This year however, I have decided it would be cheaper to print and make my own. Also, I haven't been successful in finding the journals. I did hear that some people have been finding them at the Dollar Tree. You can order then online but you need to buy a case of 24. 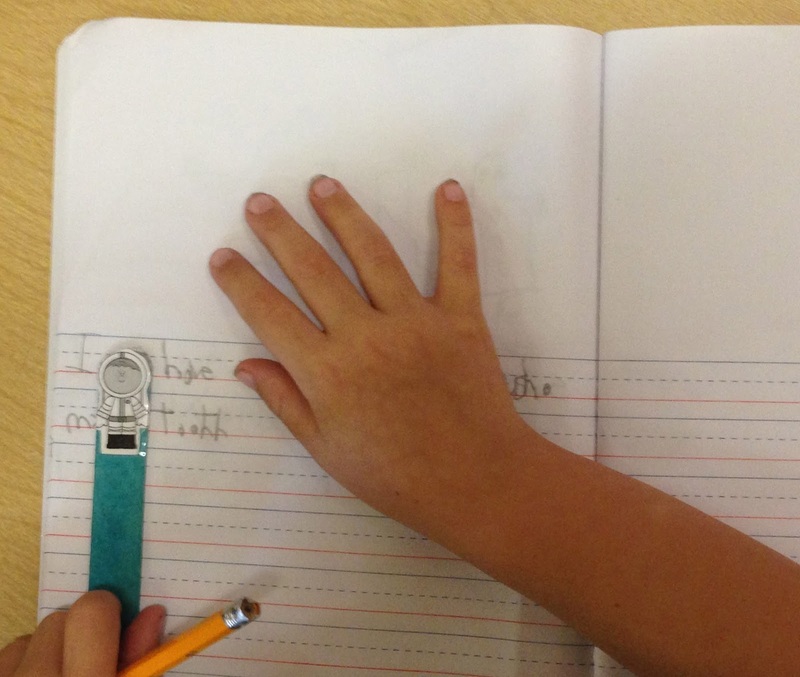 In the journals we first begin with drawing pictures. I'll give them basic prompts. Draw a picture of your family. Draw a picture about a pet you have or wish you could have. I then take it once step further and encourage them to write the names of their family members if they know them, becasue sometimes they do. If it is the pets they are writing about, then I tell them to think about the pet and say the name of the animal. What sound do they hear, what letter is that, try to write that letter. Remember, it is baby steps. At this point, I'm not worried about writing on the lines, I'm not worried that their dog looks like a big blob of mud. I'm looking to see if they can tell me what their picture is about and if they attempted to write. 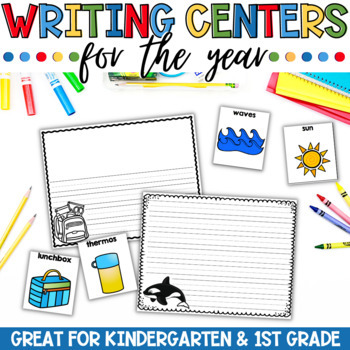 As my students move forward in writing and I want to teach more specific skills or move some students ahead or work more closely with students, I will make writing part of my center rotations. Instead of meeting with me for reading, students will meet with me for writing. This is when I will give targeted instruction on specific skills. I more than likely have already modeled these skills during my daily morning message, but this brings it to a different level. There are now only 5 students, so those who don't normally participate, just might take the pen. 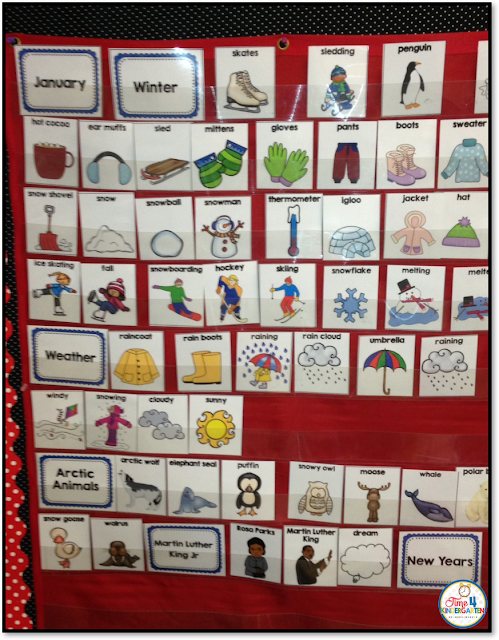 After we review a few skills, we next review the vocabulary words on the monthly word wall. Next I give them the prompt and tell each student to think of the sentence they are going to write. They then take turns saying their sentence aloud. I want them to get into the habit of saying what they intend to write. I believe it will help them to not leave out any words. For my ELL students (or others) I will give them a sentence frame, but ONLY if they need it. Students can take words from the word wall as needed when they are writing or pull out their sight word list. 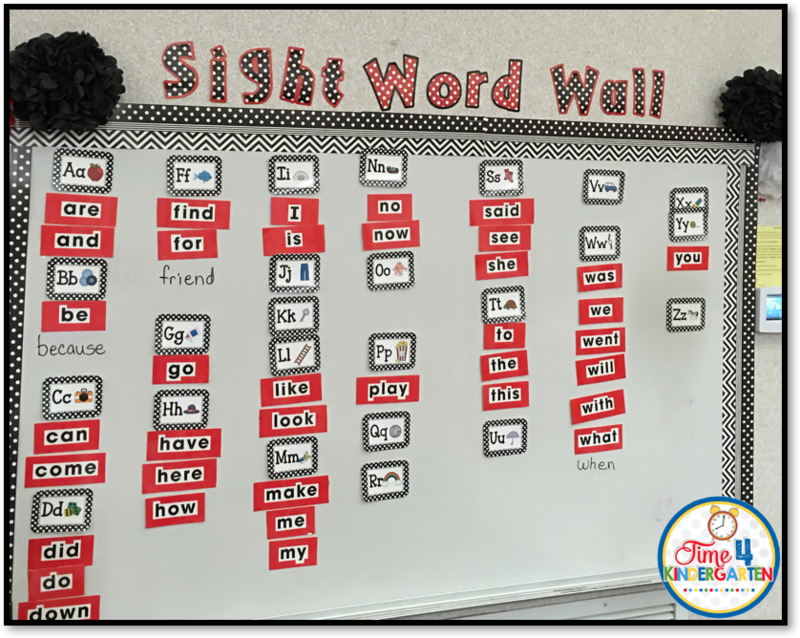 -If it is a sight word- They ask someone else in the group to help them find it on the word wall. -If it isn't a sight word- I teach them to segment it and write the parts they hear. I also make sure to tell all of the adults who help in my room the same rules. As the year progresses their knowledge of sight words has grown. so they are now able to write them and their ability to form a sentence has also improved. One idea that I have found that truly motivates my students is the "share out" piece. After they have finished I invite students to share what they have written using the Elmo. They love to see their work displayed on the big screen TV. However, there is a catch. They must demonstrate they have tried their personal best, not rushed through their work. Their drawing must have some details relating to the prompt. 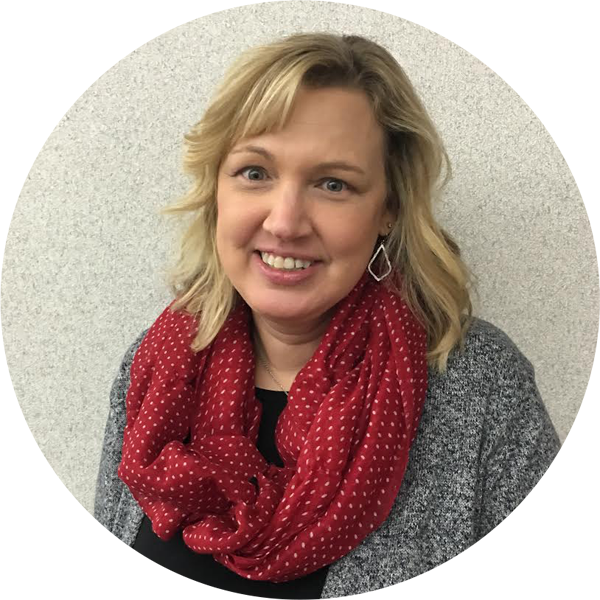 Of course all students get to share at one point during the week, but it is important to show off the ones who really put forth the effort first. This raises the bar for the others. Their work doesn't have to be the most beautiful. Just pick the ones that you as a teacher can point out what makes them shine. What you want is for all students to want to share their writing, so they will try their best in hopes that you will pick them next time. Each month the expectations increase the sentences change from the I likes, I haves and I cans to the I went to... Remember what I said before about the foundation, you have to start from the bottom up. Even if some of your kids come in knowing some letters and sounds, it won't hurt them to review those in order to bring everyone else up to speed. Build that strong foundation in the beginning giving them lots of opportunities to write in many different ways. Writing doesn't always have to be with paper and pencils. Those foundational beginnings with the the play-doh and the dry erase markers will carry over. I hope that you find something useful to get you started in setting up your writing center for the new year. This is my Writing Center Bundle for the Year which can be found in my TpT store. 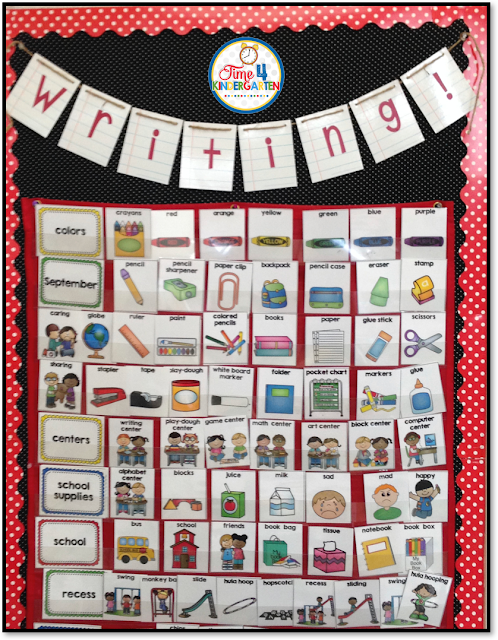 It has 9 months of thematic vocabulary cards and writing papers to help jumpstart your writing center. I would really like to see picture of your writing center and share them with my readers. 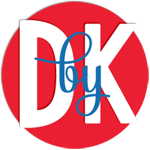 Also, be sure you are subscribing to my newsletter as I have a few things I'll be sending out soon that you won't want to miss.